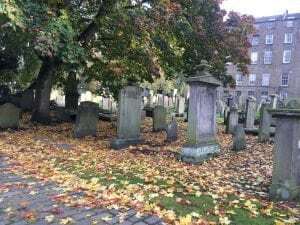 Tucked away in a quiet little corner of a busy city centre, you will find The Howff graveyard. Initially opened in 1564, it is a historian’s own heaven, housing an important collection of gravestones. 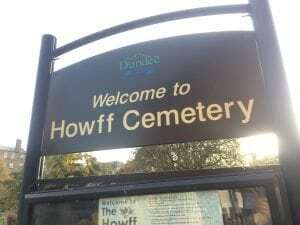 Howff means meeting place, and the graveyard was also used as a meeting point for the nine trades of Dundee. 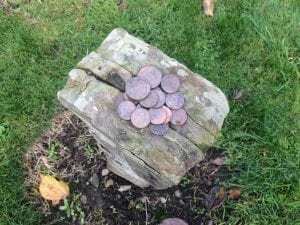 However, if you were to spend long enough wandering the eerie and enchanting pathways of the graveyard, you may stumble across an odd stone column, adorned with coinage. 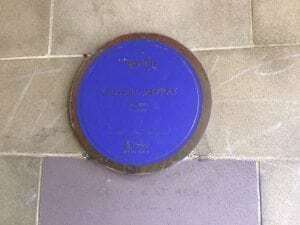 Despite the obvious favour laid to this marker, no one truly knows to whom it is dedicated to however, popular opinion names it “The Witch’s Stone” and pegs it to a certain Grissell Jaffray: the last witch to be burned in Dundee. Now that a chill haunts the air, the nights are drawing in and Samhain (the Celtic root of modern Halloween) is upon us, what better time than to tell the tale of one of Scotland’s most infamous witches? The Witchcraft Act of 1563 sent waves across the whole of Scotland, at an already turbulent time in terms of superstition and religion for the whole of Europe. In Scotland alone, 4,000 to 6,000 people (mostly women) were tried for the capital crime of witchcraft. While it is certain that a fair number of true pagans, spiritualists, and witches were convicted, many of the executions were carried out on women convicted out of raw paranoia: behaviour perceived as ‘strange’ and rival neighbours informing on each other. Not only this but the trials themselves were torturous, the odds being stacked against the convicted at the outset. One such person was Grissell Jaffray, who was strangled and burned at the stake after being held at the city’s Tollbooth in 1669. Little is known about Jaffray, including the crimes she stood trial for after the documents surrounding her execution were burned in a fire. 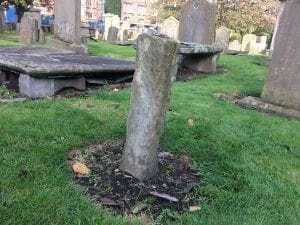 It is unknown whether she truly did dabble occult practices or if she was merely the victim of petty gossip, but one thing is for certain: the city will never forget ‘The Last Witch of Dundee’. You will see her legacy across the cobbles on Peter Street, a little alleyway connecting the Murraygate to the Seagate. Indeed, it is said that as her son sailed home to Dundee, on learning that the smoke rising above the Seagate was from her funeral pyre, turned his ship around, and never returned. 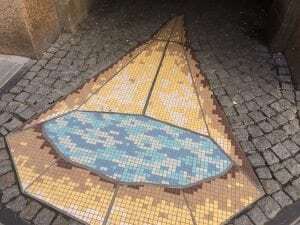 Grissell Jaffray’s mosaic in the Seagate. So come the day of Samhain, be sure to leave a coin atop the Witch’s Stone, and remember Grissell Jaffray. Hello! I'm a 20 year old English and Creative Writing student from Dundee - most likely to be found in a coffee shop. Unfortunately there is no evidence whatsoever linking the “witches stone” to Grissel Jaffrey; rather it is thought to mark the place where the 9 Trades met. The placing of coins on the stone is a relatively new phenomena, probably going back 20 years max, I had certainly never witnessed this occurrence in the 1980 or early 1990s. This being consecrated ground, I think it unlikely a witch would be buried here! I don’t know but it would be quite difficult to buy someone who was burned at the stake. I very much doubt the stone has anything really to do with witches but it’s certainly nice to have a little mythology in the city.